Heroic achievement in the superior performance of his duties while serving as Squad Leader, 3d Platoon, Company L, 3d Battalion, 3d Marines, Regimental Combat Team-7, I Marine Expeditionary Force Forward, from March to September 2006, in support of Operation IRAQI FREEDOM. During this period, Corporal Robert filled the billet of squad leader and performed his duties in an exemplary and highly professional manner. He proved himself to be the epitome of a non-commissioned officer in a combat zone with fearless actions in 250 combat patrols and 10 combat actions. His courage under fire effectively disrupted and repelled enemy attacks and ensured the safety of his Marines. While manning an observation post on 25 May 2006, his element came under attack from enemy small arms fire. Corporal Robert immediately coordinated with adjacent units and employed his squad against the enemy, resulting in the hasty withdrawal of the Anti-Iraqi Forces. His performance never faltered, despite the harsh and unpredictable environment of Iraq. 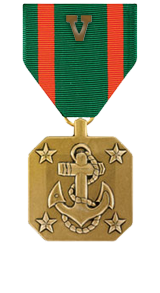 Corporal Robert’s initiative, perseverance and total dedication to duty reflected credit upon him and were in keeping with the highest traditions of the Marine Corps and the United States Naval Service.